4G STEM Camp introduces girls entering sixth, seventh, and eighth grade to careers in STEM (Science, Technology, Engineering, and Math). The camp includes 5 days of hands-on activities, lab experiments, and field trips to area businesses offering STEM-related careers. The next 4G STEM Camp is set for June 24-28, 2019. Camp meets at Bradley University and includes tours at Advanced Medical Transport, Illinois American Water, The Nature Conservancy at Emiquon, Universtiy of Illinois - Springfield, and more. To receive notification when the 2020 4G STEM Camp registration opens, you can join the E-blast Mailing List and select the 4-H Youth Development subject matter area. 4-H Teen Teacher Kate Mueller created this video highlighting 4G STEM Camp 2017. 4G STEM Camp enjoyed a week packed full of hands on activities, networking with professionals working in STEM careers, learning to navigate a college campus, meeting new friends, and having new adventures. This video highlights the first four days of 4G STEM Camp. If you need financial assistance to pay for 4G STEM Camp, please complete this form and return it to U of I Extension, Peoria County. Thank you for registering online for 4G STEM Camp 2019. To complete the process we must have these completed forms returned to our office. 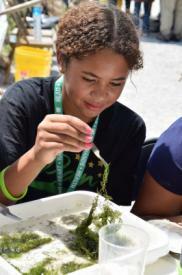 Read an insightful article about the 2014 4G STEM Camp.